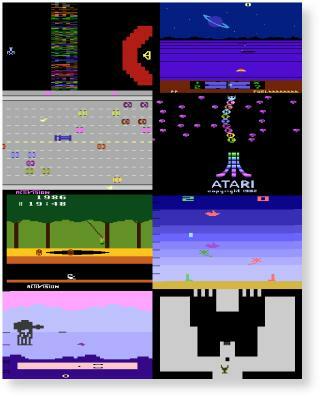 Atari 2600 screenshots were taken with the Windows version of StellaX. You can grab a copy of StellaX from our 2600 Emulation Page. To take a screenshot in Stella all you have to do is press F12 and a file in the format "Stella00.bmp" will be written to the directory you're running StellaX from. The native resolution of the screenshots is 320x200, which we then doubled in size to 640x480. This makes it easier to see the details in the shots (yeah, yeah, 2600 screenshots don't have that much detail!) You can safely shrink these images by half without losing any detail. The images were then saved in .PNG (Portable Network Graphics) format, which results in a file size of roughly ~3K per image. In general, the first screenshot of a game is taken upon powerup before the Reset switch is pressed. Then we tried to take screenshots of the game in action, showing as many unique screens as possible. It's difficult to take accurate snapshots of Atari 2600 games that use flickering to display more sprites on screen, such as Pac-Man. Since all the sprites are not visible at any given time, taking screenshots results in some missing sprites. Thus, to get accurate screenshots one needs to make a composite derived from several shots. If you'd like to contribute screenshots that we're missing, or you'd like to add to the screenshots for a game we already have shots for, please contact us. We're especially interested in captures of easter eggs, bugs, or unique screens that we're missing. Records Found: 818 Click on a column header to sort by that column. Click again to reverse sort order.